It is interesting to look back to this piece I wrote for City law firm Fox Williams in March, which was before the collapse of BHS and the appearances before the select committees of Ashley and Green. By any measure, 2016 has not been a good year for UK retailing. Among the birthday cards Sir Philip Green received for his 64th birthday on March 15 one can bet that he did not get many from BHS pensioners. If the fashion knight felt he was getting rid of the problematic variety store chain he’d controlled for 15 years by selling it to an unknown consortium called Retail Acquisitions for just £1 a year ago, he must be sorely disappointed. The small issue of what is said to be a £571m hole in the chain’s pension fund, predictably enough, has come back to haunt him. According to press reports, Green is in talks with the Pensions Regulator about contributing to the shortfall that affects 13,000 former and current staff of BHS. He is said to have offered so far £40m in cash and £40m in the form of a charge over assets of the store business. The regulator is said to be looking for £280m. Meanwhile the new owners of BHS, to no one’s surprise, have their own financial pressures. They are looking to the business’ creditors (notably the landlords for its 164-strong estate) to approve a Company Voluntary Agreement that proposes a 75% rent reduction on 40 stores and between 50% and 25% on another 47 stores. The chain’s advisor KPMG has warned that unsecured creditors could receive just 1.23p in the pound if the CVA is rejected. That is technically called putting a bit of pressure on. D-Day for the CVA is March 23. No sooner had BHS played its CVA card than up popped another perennial struggler to do the same. The small department store group Beales lost its retail bearings some time ago and was loaded with debt after acquiring 19 stores from the Anglia Regional Co-Operative Society in 2011. The business has become something of a property play, having been acquired by property magnate Andrew Perloff in January 2015 for just £1.2m; the deal reportedly included the freeholds of 11 of the 29 stores. The Beales CVA, coincidentally also being guided by KPMG, is looking to move rents for 24 Category 1 sites, which includes the company’s flagship store in Bournemouth, to monthly as opposed to quarterly payments for three years. For the remaining 14 leases, which includes offices and warehouses, it is proposed that a reduced rent, equivalent of 30%, will be paid for a period of 10 months, while the company negotiates with landlords on the basis of any continued trading from these sites. Creditors have until March 24 to agree with the proposal. To complete a sorry start to the year for the image of retailing, certain MPs continue to call for Mike Ashley to appear personally before a Select Committee to explain, among other things, the working practices at the main warehouse for his Sports Direct empire in Shirebrook, near Mansfield. Ashley reportedly has been warned that he could be in contempt of the House if he fails to give evidence at Westminster over the treatment of Sports Direct’s employees before June 1. He has until March 21 to reply, so this month really is “make your mind up time”. No doubt Sir Philip Green and Mike Ashley, who supposedly are gambling buddies, will have to take time to console each other over these latest difficulties of the media circus next time they meet at the tables. For the wider retail industry, however, the unwelcome spotlight on the alleged poor treatment of current staff and the danger to the pensions of previous and current employees does nothing to enhance the reputation or attractiveness of the sector to quality recruits. The ongoing problems at BHS and Beales are also uncomfortable reminders that once a business loses its way, it is very difficult to get it back on track, especially if it is a sprawling national concern with no apparent Unique Selling Point. 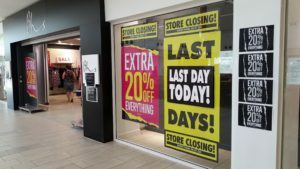 Given the over-saturated nature of retailing in the UK, and the tough trading conditions that undoubtedly will continue to prevail in 2016, even if the respective CVAs are successful, they may prove to be only a stay of execution from inevitable collapse and disappearance of Beales and BHS. They will not be the only retailers in trouble this year.